Over the last couple of years, Tesla Motors has fought legal and legislative battles in a number of states over proposed or current state laws that try to stymie its unique factory-direct sales and service model. In most cases—Massachusetts, New York, and North Carolina, among others—Tesla has managed to stave off the proposed laws, which are typically backed by franchised car dealers, or it has won lawsuits based on current laws that were brought by dealer groups. But in Texas, which has the nation's most Draconian anti-Tesla rules, the company's lobbying efforts have run into a brick wall. As a result, Texan Model S owners have had to jump through all sorts of odd hoops to buy and maintain their cars. "It was kind of a hassle," says Brad Holt, a 26-year old Dallas filmmaker, describing the purchase of his 85-kWh Model S. "But in the end, it was worth it." Texas law dictates that only franchised dealers can sell cars in the state. Tesla, of course, has no dealers. It markets its cars through company-owned stores or galleries (think Apple Store) and buyers complete the sale online through company headquarters in California. Service and warranty repairs are also handled by Tesla-owned service centers. Last spring, Elon Musk visited the Texas state capitol in Austin, and managed to find sponsors in the House and Senate for a bill that would have allowed any American manufacturer of 100-percent electric cars (i.e., Tesla) to operate in the state without franchised dealers. But, despite testimony by Musk and Tesla vice president Diarmuid O'Connell—as well as the support of Model S owners and fans who rallied inside and outside—the bills died in committee. The Texas legislature adjourned in June, and it will not reconvene until 2015. The current iron-clad Texas franchise law is the result of years of lobbying by the powerful and well-connected Texas Auto Dealers Association (TADA), founded and run for 30 years by legendary Texas lobbyist Gene Fondren. In 2012, dealership interests "invested" more than $2.5 million in the Texas legislative elections, according to the the watchdog group Texans For Public Justice. Sixty percent of Texas lawmakers received checks from TADA in 2012. Two elderly billionaire car dealers, Tom Friedkin and Red McCombs—the latter is also chairman of the former Blackwater security firm—kicked in more than a million dollars between them. Tesla, meanwhile, made no direct political contributions. The electric-car maker did, however, pay eight lobbyists a total of $345,000 to push for passage of its bill, according to TFPJ. But TADA and the car dealers more than doubled that effort, paying $780,000 for 26 lobby contracts. "If Tesla and Elon Musk are serious about breaking Texas' powerful car dealer cartel," concluded the TFPJ report last month, "they will need to drop a lot more political cash." Despite the legislative defeat, Tesla still manages to operate two stores (in Houston and Austin), three service centers (Dallas, Houston, and Austin), and three Superchargers in the state. They've also sold nearly a thousand cars to Texans. And it's all technically legal. But there are some serious limitations on how the stores and service centers are allowed to operate. Store employees, for example, may not tell visitors how much a Model S costs. They can't give test drives. They can't discuss financing, leasing, or purchasing options. Employees are not even allowed to refer interested people to an out-of-state store. No sales-related activity is permitted. "People are forced to leave the gallery frustrated, lacking sufficient information about the car and the brand," notes the Tesla website. When we called the Austin store, the young lady who answered the phone would say only that the Model S was priced like similar luxury sedans, and referred us to the Tesla website. Many Texas Model S owners, Brad Holt among them, put down their $5,000 deposits without ever having taken a test drive. Meanwhile, the service centers are owned by a local subsidiary, Tesla Motors TX, which serves as a subcontractor to the parent company. Service centers are not allowed to display the Tesla logo or advertise that they do Tesla warranty work or service. Nor are they allowed to discuss service problems or make appointments with Model S owners: All such communications must be routed through Tesla HQ in California. The factory service rep there, after talking with the owner, then calls the Texas service center to authorize whatever work needs to be done. 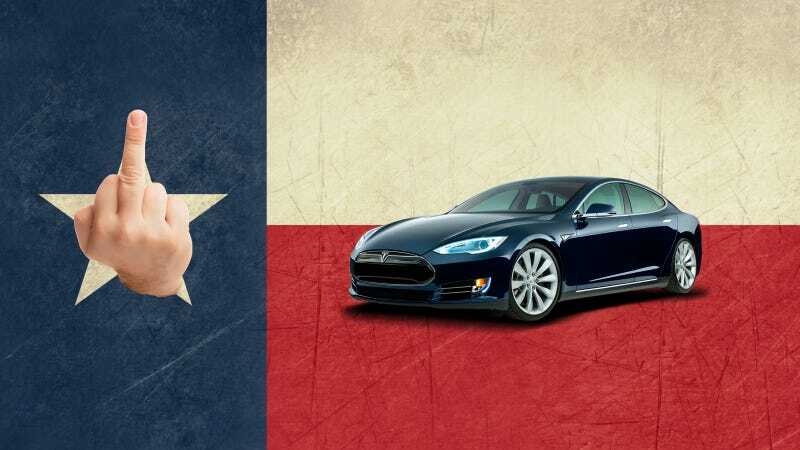 To get around the franchise laws, all Model S sales to Texas residents must be handled as out-of-state transactions. This has financial repercussions; in some cases, it's harder to get financing for out-of-state sales. "I paid a higher interest rate because of that," says Holt. "If I'd wanted to lease one, I'd have had to fly to Chicago to sign the papers," says another Texas Model S owner, Dallas orthopedic surgeon Andrew Clavenna. "And even then, I wouldn't have been able to qualify for the buyback program." Like any Model S purchaser, a Texan buys the car direct from the factory. But once the car is purchased, Texans don't get the full Tesla treatment. For a time, cars were delivered by third-party contractors, rather than Tesla employees, who typically give new owners a 3-4-hour orientation when they deliver the car. Not in Texas. "A couple of dudes showed up in the delivery truck and handed me the keys," reports Brad Holt. "They knew nothing about the car." "If I hadn't been such a fanboy and already knew a lot about the Model S, I would have been totally screwed." For non-fanboy Texas owners, Tesla offers an online video orientation. Holt also reports that his car arrived covered with road grime. Teslas delivered in other states typically arrive freshly detailed by the local delivery or service center. More recently, however, some Texas Model S owners have been picking up their cars at the service centers. Over the Labor Day weekend, Andrew Clavenna picked up his P85+, freshly detailed, at his local service center—and got the full new-owner orientation. A service center pick-up is no big deal if you live in Houston or Austin. But how about the poor guy in El Paso? That's a 600-mile trek—with two recharges required to get home. Whether delivered or picked up, a Texas Model S arrives with a temporary registration, no plates, uninspected, and with the sales tax not yet paid. "That was a hectic day, getting all that stuff taken care of," recalls Holt. In addition, he had to pay the $5,000-plus sales tax out of pocket, whereas Model S owners in other states can often finance the sales tax as part of their new-car loan. The Texas legislature will reconvene in January 2015. In the meantime, will Elon Musk and Tesla drop the political cash necessary to sway legislators? Might a rising tide of public opinion, fostered by enthusiastic model S owners, have any effect? Finally, will Texas legislators acknowledge the hypocrisy of beating the drum for free enterprise and against government regulation—while simultaneously supporting regulations that inhibit that very free enterprise? Stay tuned. Perhaps buyers of the Tesla Model X electric crossover, due to enter volume production late next year, will fare better. David Noland is a veteran journalist, self-proclaimed electric car nut, climber of Mt. Kilimanjaro and adventurer. His work has appeared in National Geographic Adventure, Outside, The New York Times, and Popular Mechanics. This story originally ran in Green Car Reports.